Students participating in a four hour studio workshop in the early stages of a costumed portrait. I have over ten years' experience conducting visiting artist painting workshops at high schools and colleges. 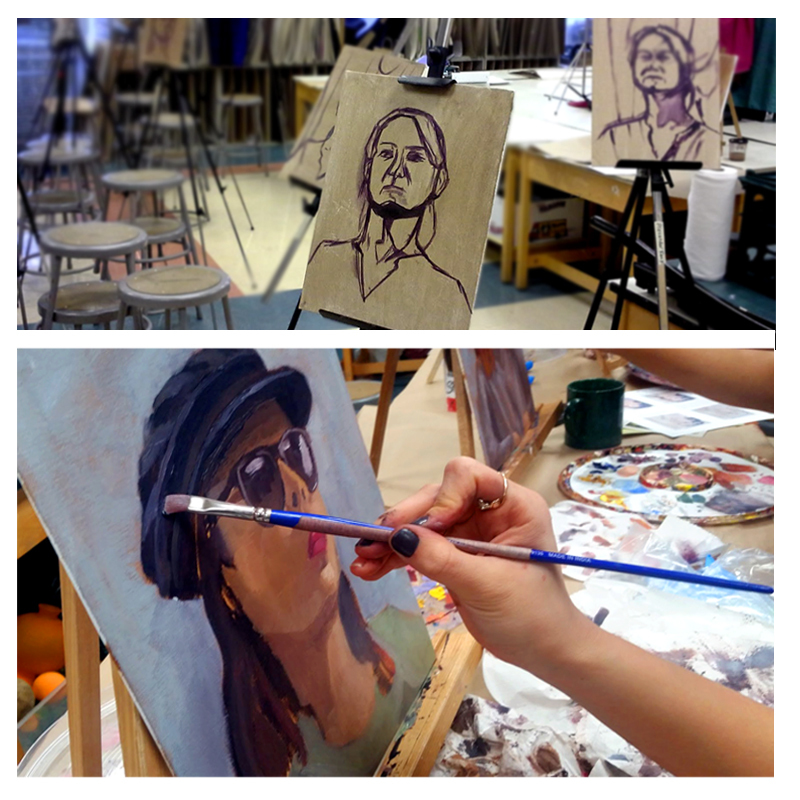 Whether you're an art department looking to tackle oil and acrylic painting with your advanced students, or perhaps looking to refresh your own skills with an after school continuing education program, we will work together within your budget and time frame to put together a fun and informative workshop, exploring picturing making techniques through portrait, landscape, or still life painting, and creating a clear and manageable path for future growth. With a live model, a limited palette, and a single 1/2 inch brush, we'll walk step by step through the process of blocking in a composition and building a picture in clear stages, with emphasis on seeing, color mixing, and brush technique. Canvases or canvas panels, 11x14. Additional topics discussed include using photo reference; drawing, composition, and proportion; studio safety; and development of healthy and sustainable work habits. Sometimes—particularly in a college environment—all you may be looking for is a demo in lieu of a full workshop. I offer oil painting demonstrations and studio talks that can be custom tailored to your class time. Sometimes the full-time act of teaching leaves little room for developing or brushing up on our own traditional skills. My continuing education workshops, whether in portraiture, landscape, or still life painting, can take place right in your classroom after the school day lets out, accommodating any number of faculty members; offsite weekend workshops are also possible. These relaxed, low key events focus not only on engaging in the hands-on practice of art making, but do so with an emphasis on methods for teaching painting. As with my student workshops, we'll walk through a step-by-step linear process for building a painting from a limited palette, with forays into studio safety and time management, but we will simultaneously discuss these subjects as educators, organizing the necessary information and methods into practical teaching applications.